Early Dawn over the Pacific Ocean has the ability to produce a true gamut of colors - from the deep blue in the receding night sky, to a coral and pink of the approaching dawn, and the many shades of color in the reflections on the water. 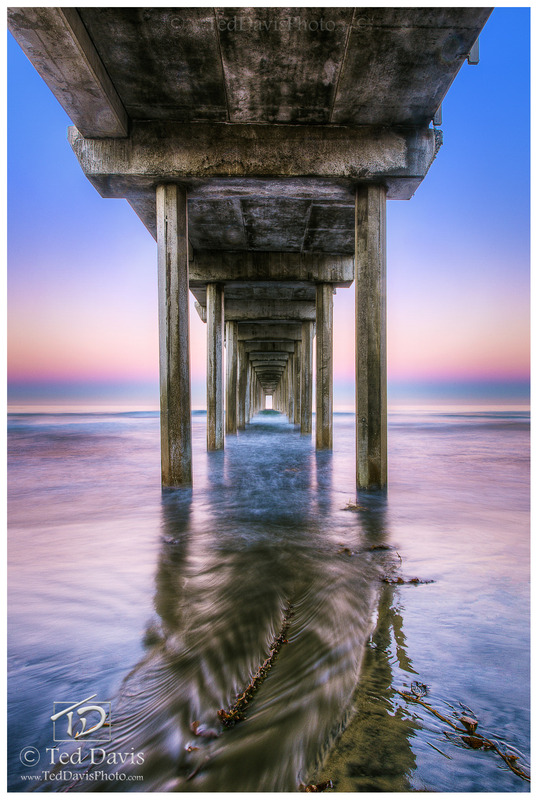 With a long exposure to capture the moving waves and create a misty effect down the center of the pier, the feeling of ethereal timeless beauty was captured. As if you were standing in the cold ocean water under the pier as the sun rises, the seaweed leads the eye towards the horizon and the tantalizing beauty beyond. Photo © copyright by Ted Davis. All material © copyright by Ted Davis. All rights reserved. Site by WideRange Galleries.